4 Fantastic Four: World's Greatest Heroes. A technically quite excellent and very modern take on the Fantastic Four, "World's Greatest Heroes" may not delight purists but is largely successful on its own terms. The vibrant, Manga-style art has Sue and Johnny's chins tapering down into a point, and there's also the unusual mix of three dimensional computer art and two dimensional drawings (most notably in the Impossible Man and Terminus episodes), and the nagging feeling that the pacing in some of the episodes is a little off. The cartoon is, while sometimes languid in pace, also more sophisticated than what came before in many ways, reconfiguring the Lee-Kirby mythos with a more postmodern take. This largely entails self-aware mockery of the goofier villains four decades later, including the team's awareness that the Skrulls are "dumb". While this can be seen as a little disrespectful to the source text and means that it's sometimes hard to take it seriously in some episodes, Johnny accusing Namor of wearing his sister's pants is pretty amusing all told. while it maybe lacks the charm of the best of yesteryear's takes on the group, it has its own sense of identity and humour, and after a couple of false starts with too broad comedy, it soon settles down. The 60s had the loveability factor, and the second 90s season set the benchmark for a faithful adaptation of the source text, but this deserves to sit with them as its own worthwhile take. The cast is uniformly one of the best assembled for a Fantastic Four cartoon, with not a single dud amongst the foursome. Hiro Kanagawa's dry, understated take on Reed takes a few episodes to get used to, but is superbly witty, and Brian Dobson's Ben and Lara Gilchrist's dominant, empowered Sue are also well cast. The major issue with the cartoon may concern Christopher Jacot's "slacker" take on Johnny, which is a characterisation more in keeping with the Chris Evans movie persona and not the comic book, but he does extremely well within the parameters of the role and Mark Waid fans should love it. Originally planned for two seasons of thirteen episodes each, the series was pulled by Cartoon Network without explanation after just seven episodes were screened. With broadcast of the first season resuming eight months later, it's not yet known whether this was to take advantage of the release of Rise of the Silver Surfer or a more negative reason. The show was again pulled, this time after nine episodes, and the remainder aired years later on Nicktoons. The Episodes, which last for around 22 minutes, were as follows: Trial By Fire/Doomed/Doomsday/Hard Knocks/My Neighbor Was A Skrull/World's Tinest Heroes/Zoned Out/Imperius Rex/Puppet Master/Impossible/Bait & Switch/Annihilation/De-Mole-Ition/Molehatten/Revenge of the Skrulls/Strings/Doomsday Plus One/The Cure/Frightful/Out of Time/Atlantis Attacks!/Shell Games/Johnny Storm and the Potion of Fire/Contest of Champions/Doom's Word Is Law and Scavenger Hunt. Highlights of the run include the time-travelling parodoxes of Out Of Time and the enjoyably plotless Hulk episode, Hard Knocks. ("On second thought... Hulk out all you want - this is Johnny's car. "), Also worth a look are the entertaining Bait and Switch, the suitably complex Doomsday and Imperious Rex, despite Michael Adamthwaite's somewhat fey take on Namor. (Talking of voices, Annihilation has Annihilus talking amusingly - and presumably unintentionally - like Papa Lazarou from the UK comedy The League of Gentlemen "You my wife now!"). Also greatly interesting is The Cure, an episode that has the She-Hulk taking Ben's place and homages the classic Issue #177. 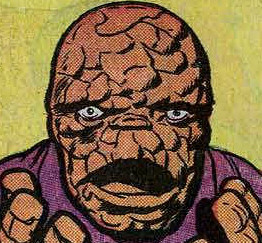 But it also contains much originality, as Reed invents a device that can rebuild Ben's atomic structure so that he changes back into Ben Grimm... but as the machine only has his DNA profile pre the change, it restructures his brain so that he has no memory past the events when he became The Thing. Low point has to be My Neighbor is a Skrull. For such a modern take on the series, it still has an alarmingly retro sensibility at times, with "comedy neighbour" Courtney and her dog there to provide non-existent laughs. This is brought to the full in the fifth episode, where one or two nice twists can't escape the generally pedestrian plot and incredibly broad humour in this ill-advised "comedy" episode. The Skrull follow-up is nearly as bad, combining broad comedy with some inappropriately violent scenes and instruments of torture, while Zoned Out is another stinker. Yet overall there are only maybe three or four below-par episodes, and over half the run is above-average. Older readers may not get as much out of it as its target audience, but all told this was a fairly strong set of stories.